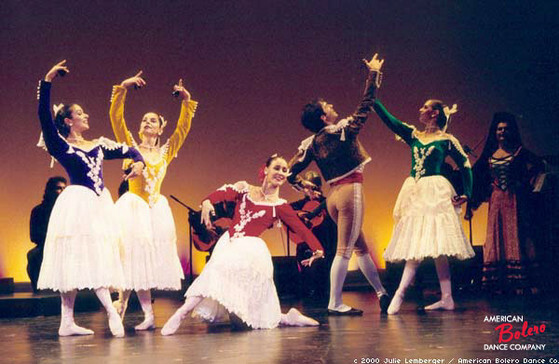 The American Bolero Dance Company, founded by Gabriela Granados in 1996, explores the rhythmic intricacies and song literature of Flamenco, the refined and stylized repertory of Clásico Español and the traditions of the Escuela Bolera. ABDC's productions are noted for their integration of theatricality, imaginative choreography and authentic costuming. ABDC's primary goal is to bring the music, history and tradition of Spanish Dance to the United States. As ABDC grows in artistic scope, grounded in these great traditions, it continues to foster collaborations among dancers, singers, musicians, and choreographers of diverse training and backgrounds, embracing the multi-ethnic styles arising from the centuries of cultural flow between Spain and Latin America. In understanding the roots of Spanish dance, as well as its myriad influences on other cultures, ABDC's productions deepen a genuine appreciation of the artistic bridge that connects the Iberian Peninsula and the Americas.